Enjoy an adventure across the high Atlas Mountains to the Moroccan cities of Ouarzazate and Ait Ben Haddou on this private, full-day trip from Marrakech. Along the way, stop in a Berber villages for a coffee break with a spectacular panoramic view. 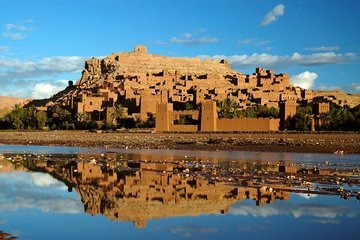 Then it’s on to Ait Ben Haddou, a UNESCO world heritage site, and Ouarzazate, the ‘door of the desert’ and noted film-making location. Lunch plus a Marrakech hotel pickup and drop-off are included.